At The Mosaic Stories, we’ll be highlighting books that shed light on the diverse cultural heritage of the Middle East. 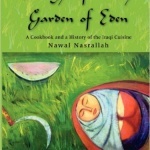 We’re especially interested in novels in translation that bring us into the diverse tapestry of Middle Eastern cities, of cookbooks that show off the complex recipes that come from shared communities with culinary heritage along spice routes, and of books highlighting the rich handicraft traditions of the region. Feel free to contact us with suggestions, or if you have a book you think we might like to feature on the site. 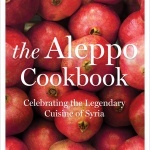 It is hardly surprising that Aleppo, one of the world’s oldest continuously inhabited cities, is also home to one of the world’s most distinguished and vibrant cuisines. Surrounded by fertile lands and located at the end of the Silk Road, which passed through Central Asia and Mesopotamia, Aleppo was a food capital long before Paris, Rome, or New York. Its diverse communities of Arabs, Kurds, Armenians, Circassians, and others contributed to its culinary traditions and produced a vast selection of different types of dishes – and no less than 20 kinds of kibbeh recipes. Here, one of the Arab world’s most renowned chefs unlocks the secrets to this distinctive cuisine in this comprehensive cookbook filled with practical guidance on Middle Eastern cooking techniques as well as step-by step explanations of over 200 irresistible recipes, such as Chili and Garlic Kebab, Syrian Fishcakes, Lamb Stuffed Eggplants, Semolina and Butter pudding, and the queen of the mezze table, Red Pepper and Walnut Spread. Divided into 15 chapters (Basic Recipes; Appetizers and Mezze; Soups; Salads and Accompaniments; Grains; Fish; Poultry; Meat; Kibbeh; Stuffed Dishes; Vegetables; Stews; Bread; Desserts and Sweets; Pickles and Preserves; and Beverages), traditional cooking and preservation methods go hand-in-hand with modern combinations of flavors and today’s desire for healthful and natural meals. Of particular interest are the book’s numerous folkloric stories, anecdotes, songs, cultural explications of customs, and excerpts from narratives written by foreign visitors to the region. Arabic calligraphy, and photos, paintings and sketches add to the pictorial appeal of the book. This book is a record of the 50 years Widad Kawar spent researching, collecting and preserving part of the heritage of Palestine. This endeavor evolved into the Widad Kawar Collection, the largest to date of Palestinian, Jordanian and other Arab traditional dress and accessories, comprising more than 2,000 items. In the following chapters she presents the story of how the collection evolved and she introduces the life stories of the women who produced the beautiful costumes it contains. For her, each item calls to mind an individual or a place: a wife, a mother, a daughter, a family, a house, a village, a town, a field, a market. Each item was worn on special occasions, happy and sad, that marked the owner’s life. Much of Widad’s knowledge stems from the personal narratives of these women whose embroidery and dress-making skills she so admires. 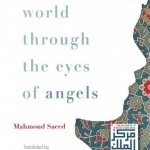 With this book she pays homage to Palestinian women. 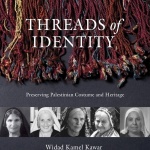 Threads of Identity is a history of Palestinian women of the 20th century told through aspects of popular heritage, focusing on traditional dresses but also including textiles and rug weaving, rural and urban customs, cuisine, and festivities. The interviews with women who lived through the traumas and changes of the 20th century are a contribution to oral history, augmenting standard historical accounts. While most writing about the Middle East concentrates on politics, her book focuses on the dignity of ordinary people, and women in particular, bridging the gap between the major events of history and everyday life. Yona’s son Ariel grew up in Los Angeles, where Yona had become an esteemed professor, dedicating his career to preserving his people’s traditions. 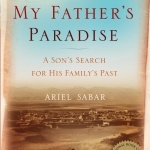 Ariel wanted nothing to do with his father’s strange immigrant heritage―until he had a son of his own.